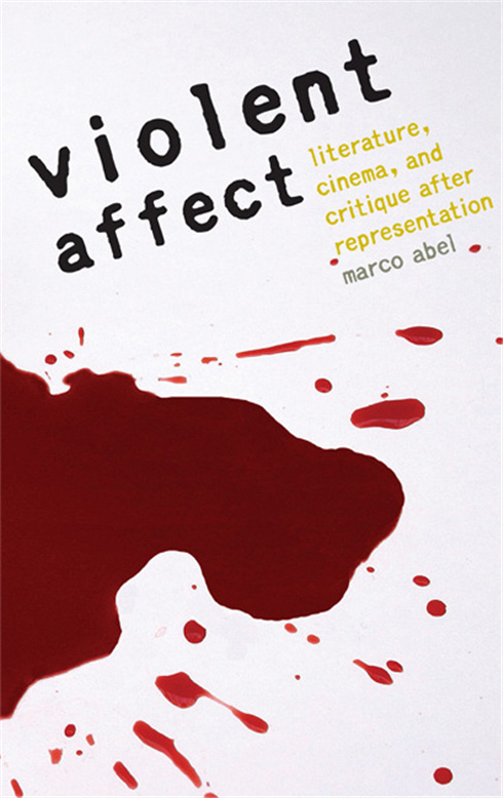 After my first book, Violent Affect: Literature, Cinema, and Critique after Representation (University of Nebraska Press, 2007), I switched my research focus to contemporary German cinema. In addition to a host of articles on and interviews with contemporary German filmmakers, I also published two books on the subject: The Counter-Cinema of the Berlin School (Camden House, 2013), which won the German Studies Association prize for Best Book 2014, and as co-editor Im Angesicht des Fernsehens: Der Filmemacher Dominik Graf (text + kritik, 2010), which at the time was the first book on what is arguably Germany’s greatest contemporary genre filmmaker. 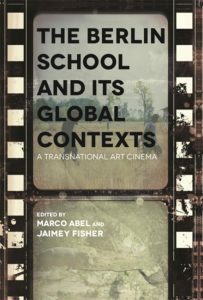 Also as co-editor I’m currently working on A Transnational Art-Cinema: Berlin School and Its Global Contexts (under contract with Wayne State University Press, forthcoming 2018/19), Celluloid Revolt: German Screen Cultures in the Long Sixties (under contract with Camden House, forthcoming fall 2018), and a special issue on Berlin School filmmaker Christian Petzold for Senses of Cinema (forthcoming summer 2017). I have also co-edited a special issue for The Sixties: A Journal of History, Politics and Culture, “What was Politics in 68? A Special Issue on the West German Sixties,” which appeared in 2015. This last project connects with a new research project I’m in the process of developing, which deals with the so-called New Munich Group of filmmakers (specifically, Klaus Lemke, Rudolf Thome, Max Zihlmann, Roger Fritz, Martin Müller, and the duo May Spils/& Werner Enke) of the mid to late 1960s. Together with my departmental colleague, Roland Végső, I’m also co-editor of the book series, Provocations, which the University of Nebraska Press publishes. With Roland Végső. “Biopolitical Education: The Edukators and the Politics of the Immanent Ourside.” Studies in Twentieth and Twenty-First Century Literature 40.2 (summer 2016) (special issue on “On 24/7: Neoliberalism and the Undoing of Time,” eds. Necia Chronister & Lutz Koepnick): 11,000 words. “Henner Winckler: Filming Without Predetermined Results.” Senses of Cinema 77 (December 2015): 11,3000 words ms.
“Introduction: What Was Politics in '1968' in West Germany?” With Alexander Vazansky. Introduction to “What was Politics in 68? 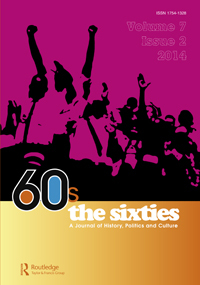 A Special Issue on the West German Sixties.” Eds. Alexander Vazansky and Marco Abel. The Sixties: A Journal of History, Politics and Culture 7.2 (12/2014; published summer 2015): 83-98. “Seeing and Saying.” Berlin School Glossary: An ABC of the New Wave in German Cinema. Eds. Brad Prager, Kristin Kopp, Lutz Koepnick, and Roger Cook. London: Intellect, 2013: 231-237. “Yearning for Genre: The Cinema of Dominik Graf.” Generic Histories of German Cinema: Film Genre and Its Deviations. Ed. Jaimey Fisher. Rochester: Camden House, 2013: 261-284. “The Agonistic Politics of the Dreileben Project.” German Studies Review 36.3 (summer 2013): 607-616. This is my contribution to “The Berlin School (1): The DREILEBEN Experiment,” Marco Abel and Christina Gerhardt, eds., German Studies Review 36.3 (2013): 603–642. “The Minor Cinema of Thomas Arslan: A Prolegomenon.” Turkish German Cinema in the New Millennium: Sites, Sounds, and Screens. Eds. Sabine Hake and Barbara Mennell. Oxford & New York: Berghahn Books, 2012: 44-55. “22 January 2007: Film Establishment Attacks 'Berlin School' as Wrong Kind of National Cinema.” A New History of German Cinema. Eds. Jennifer Kapczynski and Michael Richardson. Rochester: Camden House, 2012: 602-608. “Sehnsucht nach dem Genre: Die Sieger von Dominik Graf.” In Im Angesicht des Fernsehens: Der Filmemacher Dominik Graf: 78-104. This essay is a translation of “Year for Genre: The Cinema of Dominik Graf,” Generic Histories of German Cinema: Film Genre and Its Deviations, Jaimey Fisher, ed. (Rochester: Camden House, 2013). 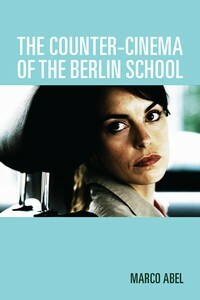 “The Counter-Cinema of the Berlin School.” Cinema and Social Change in Germany and Austria. Eds. Gabriele Mueller and James M. Skidmore. Waterloo, Canada: Wilfrid Laurier University Press, 2012: 25-42. “'A Sharpening of Our Regard': Realism, Affect, and the Redistribution of the Sensible in Valeska Grisebach's Longing [Sehnsucht].” In German Language Cinema in the New Millennium: Beyond the Cinema of Consensus? Eds. Paul Cooke and Christoph Homewood. I.B. Taurus, 2011: 204-222. “Die Sieger.” Quarterly Review of Film and Video 27.5 (2010): 410-413. “Imaging Germany: The (Political) Cinema of Christian Petzold.” The Collapse of the Conventional: German Film and its Politics at the Turn of the New Century. Eds. Jaimey Fisher and Brad Prager. Detroit: Wayne State UP, 2010: 258-284. “Yearning for Genre: The Films of Dominik Graf.” Cine-Fils: Cinephile Interview Magazine (http://www.cine-fils.com) March 2010: 4,000 words. “Underground Film Germany in the Age of Control Societies: The 'Cologne Group'.” Quarterly Review of Film and Video 27.2 (2010): 89-107. “Failing to Connect: Itinerations of Desire in Oskar Roehler's Post-Romance Films.” New German Critique 37 (1 109) (Winter 2010): 75-98. “Intensifying Life: The Cinema of the 'Berlin School'.” Cineaste: America's Leading Magazine on the Art and Politics of the Cinema online 33.4 (Fall 2008): 7,800 words. Reprinted in Portuguese as “Intensificando a vida: o cinema da 'Escola de Berlim',” trans. Cristian Borges, in Nova Cinema Independente Alemão: Uma outra politica do olhar, ed. Cristian Borges (São Paulo: Centro Cultural Banco do Brasil 2009): 22-39. This catalogue accompanied a retrospective of the Berlin School that took place in São Paulo 11 February - 1 March, 2009. Slightly revised and reprinted in German as “Das Leben intensivieren: Das Kino der 'Berliner Schule',” trans. Sabine Wilke, in Literatur für Leser 54 (2/10): 113-125 (published April 2011). “The State of Things: More Images for a Post-Wall Reality—The 56th Berlin Film Festival.” Senses of Cinema 39 (April-June 2006): 8,400 words. Access at http://sensesofcinema.com/2006/festival-reports/berlin2006/. “Intensifying Affect.” Electronic Book Review, October 2008: 11,000 words. 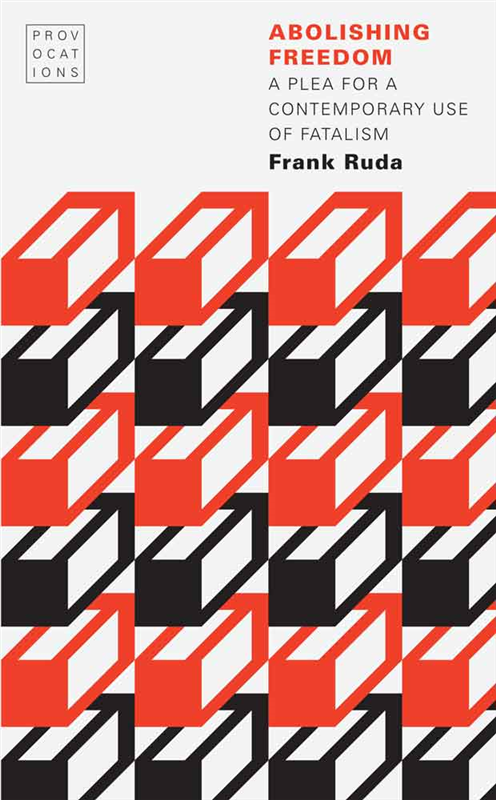 “Speeding Across the Rhizome: Deleuze Meets Kerouac On The Road.” Modern Fiction Studies 48.2 (! Summer 2002): 227-256. Judgment is not an Exit: Toward an Affective Criticism of Violence with American Psycho.” Angelaki 6.3 (December 2001): 137-154.